The Guide to Pitcairn states that after Folger's discovery of the community in 1808, the pattern of communication was essentially one of irregular naval and merchant ship visits. The opening of the Panama Canal in 1914 brought new life to the island and changed the connection with Pitcairn's neighbours with New Zealand becoming a more important link than Tahiti. Passenger services however via the New Zealand Shipping Company and the Shaw Savill and Albion Company were eventually withdrawn which left only cargo vessels to call en-route and this vital communication provided vital supplies for the Islanders. In recent years the worldwide increase in interest to cruise the world's oceans has led to a new vitality within the Pitcairn community. "With the number of visiting cruise ships steadily increasing each year, Pitcairn's cruise ship season is always a busy time. Typically it starts around Oct/Nov and runs through to April the following year. The size and type of ship ranges from small expedition vessels, carrying 100 or so passengers, to huge ocean liners carrying up to 2500 - 3000 passengers. With this in mind, Pitcairners must find time to get into their studios and workshops to create their carvings, curios and artwork. These days there's a huge range of Pitcairn keepsakes available, from jewellery, to all types of wooden carvings, bowls and platters, caps & T. Shirts, hand-woven traditional baskets, Bounty and Longboat models, handmade soaps and, of course, Pitcairn Honey. Most cruise ship companies confirm their booking to visit the island at least a year or so in advance. The booking is confirmed by the Island's Immigration Officer, an announcement of the pending visit made over the radio and the ship's name, arrival and departure times added to the Cruise Ship Bookings List which is ever present on the Public Notice Board at the Square. As the day of arrival draws near the Immigration Officer, Tourism Coordinator, Mayor and Provisions Officer start corresponding, via email, with the ship to coordinate activities for the day. This varies depending on roles and whether the ship's Captain intends to land passengers or feels it's safer to have the Pitcairn Community go on-board to set up the Pitcairn Island Curio and Craft Market, deliver a lecture and mix and mingle with passengers for a few hours. These days approximately 35 - 45 Pitcairn residents might go out to visit a ship which is unable to land passengers. Those who are unwell or perhaps a little too frail to climb the Jacob's ladder to board the ship are encouraged to allow friends and family to take their goods on board for them - ensuring that everyone has the opportunity to trade and benefit from sales. Landing cruise ship passengers is always at the Captain's discretion, depending on weather and sea conditions on the day. This means that everyone must be ready to either get themselves and their curio and crafts to the landing in time to go out to the ship or to set up their goods and trading tables along the main road or at the Square in Adamstown. Either way it's always a happy and exciting time with no one really sure which way it will go until the Captain has made his or her final decision. For many cruise ship passengers, getting to Pitcairn is the highlight of their trip. Whether they are able to land or not most convey that having the opportunity to personally meet the descendants of the Bounty Mutineers and learn about their day to day lives is what really makes their time at Pitcairn so truly memorable. And it's a mutual experience. Over generations Pitcairners have forged lifelong friendships with passengers, captains and crew who have visited via cruise ships. At the close of a typical visit both visitors and locals are refreshed and revitalised - satisfied with the day's events, sights seen and friends made". 2013 will see eight cruise ships visit with eleven expected in 2014. These ships are often very large and like the Queen Victoria and those in this stamp issue, carry passengers and crew totalling over 2,000 people which is over 40 times the population of Pitcairn! 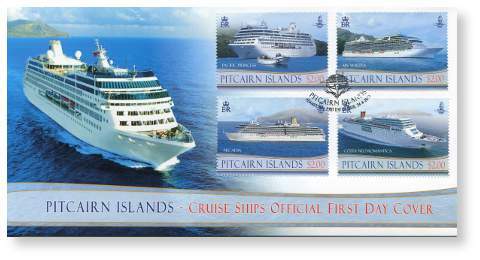 Acknowledgement: The Pitcairn Islands Philatelic Bureau acknowledges the valuable assistance of Carnival UK; Prestige Cruise Holdings and Princess Cruises.